Stop Telling Me To Be Quiet « Eric Anthony Grollman, Ph.D. It seems the universe has been dead-set on silencing, immobilizing, paralyzing, and deradicalizing me since my birth. In simply being myself, which happens to entail being outspoken about injustice, I have been labeled uppity, radical, provocative, militant, showy, hypersensitive, and a trouble-maker. In choosing to pursue a career in which I make change from within the system, I have struggled much of my life with finding the right balance of keeping my position and speaking out. Worrying about what others think of me, specifically of losing out in major ways, I remained in the closet until age 17. You would think it would be smooth sailing since then. Actually, the further I have gone in my career — college, graduate school, and now a tenure-track faculty position — the more anxiety I have felt about how I present myself to the world. At the same time, the “innocent” requests to shut up, hide, and stand still have increased. Even at my quietest, most inauthentic, and politically inert point, I still receive these request. It seems the universe won’t be satisfied until I completely disappear. Or, maybe become a white straight man who upholds the status quo. Recently, I ran into a friend who relayed to me other friends’ concerns that I am “too out there” in my new job. Their thinking, along with everyone else’s it seems, is that tenure-track faculty should be seen and not heard. Particularly for me as a young Black queer man, in an interracial same-gender relationship, living in the South, I should be ever vigilant about how I present myself to the world. Duh. I did not secure this job without doing that for years in graduate school. I did not burst through my university’s doors declaring I would radically change the place. Trust me. To survive in this racist, sexist, heterosexist society, there is not a single day in which I do not constantly think about self-presentation. When the quantoid in me lights up, I am really fed up with these requests. I have lost count of the number of times I have been encouraged, usually from a place of concern, to be quiet, tone it down, hide who I am, etc. Whatever the number, it far exceeds the times I have been encouraged to speak up, be seen, or shake things up. And, let’s count the number of people who quietly exist within the status quo. There are plenty. 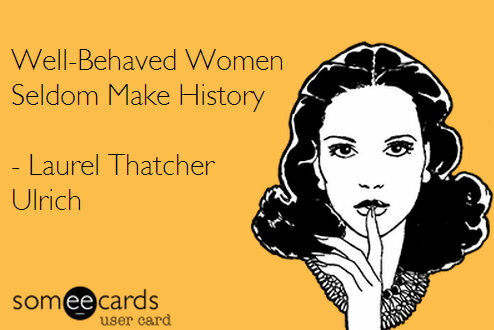 We can afford to have just one more person who may make herstory by refusing to be “well-behaved” and quiet. Where is the limit on being well-behaved? Is being a good little black gay graduate student for six years enough, just til I get a PhD and a job? No? Oh — maybe it is the seven years of wearing suits that betray my genderqueer identity and stressing myself to publish in my discipline’s top journals — you know, to secure tenure. Assuming I am of the rare sort to finish graduate school before 30, that means I can finally be free to be my outspoken self in my mid-thirties. That is, you know, banking on tomorrows that are not promised to any of us. And, outspokenness and activism are not the only things that are policed. It is my identities as a queer person of color that are seen as a threat. By entering into spaces that historically have excluded people like me, now shaping the next generation’s minds, I am a threat. I am a threat whether I hold radical politics or not. I could play it “safe” by academic standards and still be lynched outside of work because of my race. Or, I could be denied tenure — you know, because discrimination and harassment occur within academia, too. It is a damn shame, but the truest reality of them all is that my PhD merely affords me a different kind of policing of black and queer bodies. I am tired of having to name my career path as one that seems out of the norm. I am tired of having to justify not pursuing that good, ol’ prized Research I (R1) path, or even the silent, politically inert journey toward tenure at any type of school. More importantly, in the midst of this miserable first semester, all that I do that is being read as outspoken or radical are merely strategies for my survival. I am trying to carve out space in the universe so that I can actually get out of bed in the morning to go to work. I note the good intentions behind the requests for silent inaction. I appreciate it. But, they typically come from people who do not know me well enough to give that kind of advice. They do not know how much I really do negotiate interactions with others. They do not know how many times I have completely shutdown because something so offensive has been said and I stew in guilt for not speaking up. They do not know how many mornings I fight with my body and body image issues trying to fit into costumes deemed appropriate for professional men. They have assumed I am recklessly opening my mouth without thinking, without doing my homework to make an informed critique, and without thinking about the potential consequences. I am not an idiot. I know what can happen to “outspoken faggots” and “uppity niggers”. In a way, I am risking my life, or at least my status and position, to prevent that for myself and others like me. So, please do me a favor. Stop telling me to be quiet. By Dr. Eric Anthony Grollman in Academic Freedom, Activism, Discrimination and Bias, graduate school, LGBTQ Scholars, Scholars of Color, tenure-track on November 25, 2013 .